Longtime community activist Teresa Fraga stands near the site where crews could soon begin building a proposed “rails to trails” path from Pilsen to South Lawndale. Jose Perez, a lifelong Pilsen resident, remembers when the Burlington Northern Santa Fe (BNSF) railway, which runs through the east side of Pilsen, provided entertainment for him and his friends growing up. “When the train would come, we would jump [on] it and then get off at Western,” he said. After the area was abandoned, it grew over with brush and became a hangout for gang members, said Perez. Now, as an insurance agent and owner of five buildings in the surrounding neighborhood, Perez is excited about the possibility that the former railway could once again become a source of enjoyment for Pilsen residents. In March 2016, Mayor Rahm Emanuel formally announced a plan to transform the abandoned BNSF railroad into a multi-use path called the Paseo, similar to the Bloomingdale Trail, or 606, on the city’s North Side. Part of a citywide “rails-to-trails” initiative, the Paseo would transform four miles of abandoned railway running from the east side of Pilsen to South Lawndale. While the timeline for the proposed path is still uncertain, construction on the easternmost portion of the path, along Sangamon in Pilsen, could begin as early as this year, pending a purchase agreement between the city and the BNSF railroad. At least $1.7 million from local tax increment financing districts, or TIFs, has already been allocated for feasibility studies, land acquisition, and construction costs for the trail, “pursuant to each district’s formal redevelopment goals,” according to Peter Strazzabosco, deputy commissioner for the Chicago Department of Planning and Development. Most of that money will come from the Pilsen Industrial Corridor TIF. But not all Pilsen residents view the Paseo as a symbol of positive change. While some residents champion it as a long-fought-for improvement for the historically under-resourced Latino neighborhood, others fear it will contribute to already rising property values and make Pilsen even less viable for its remaining low-income residents. Pilsen has seen a drastic population shift in recent years. Between 2000 and 2015, the neighborhood’s Latino population decreased by 29 percent as the median income decreased. Teresa Fraga was a part of that committee. 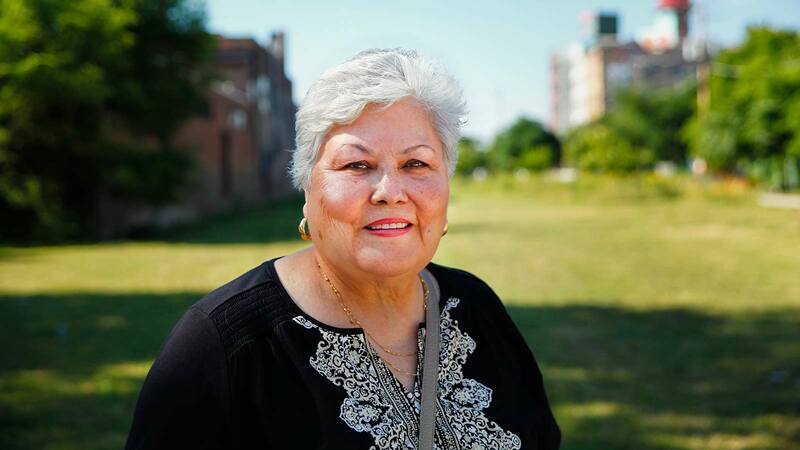 A resident of Pilsen for 52 years, Fraga takes pride in being able to tell stories about every home on her block, as well as name every homeowner. She also takes personal credit for proposing the Paseo. She says she wanted to transform a longtime eyesore into something beautiful for the community. For Fraga, securing city investment to improve Pilsen has been her life’s work. Fraga is a longtime member of Pilsen Neighbors Community Council, an organization that seeks to build community leaders. She also sits on the board of Alivio Medical Center and co-founded the Eighteenth Street Development Corporation (ESDC), an organization that supports local businesses in Pilsen. Ald. Danny Solis, 25th Ward, supports the initiative. “Not only will the Paseo bring biking convenience and accessibility to the outdoors to this area, the trail will blend our local Pilsen identity for the benefit of all Pilsen residents,” he told WTTW. Fraga says talk of the Paseo has already spurred improvements in the neighborhood. “There used to be no sidewalk here,” she said, pointing to a newly renovated sidewalk along Cullerton at the intersection of Sangamon. “It was just an ugly area our children had to walk through on their way to school,” she said. Now the El Paseo Community Garden, located between the proposed trail and the Casa Maravilla senior apartments, is in its eighth year of operation. Constructed during the first phase of the Paseo project, the garden offers a community compost bin, collective and individual gardening plots, and public events, including yoga classes, boxing classes, bonfires, and movie nights. In the summer of 2016, after pressure from the Pilsen Environmental Rights and Reform Organization, (PERRO), BNSF remediated lead-contaminated soil along Sangamon Street between 16th and 21st Streets and removed more than 100 tons of tracks. That portion of the trail has since been planted with grass. Fraga is excited by the opportunity to incorporate Pilsen’s native talents into the Paseo through plans to involve local artists to paint murals along the trail. She wants the Paseo to be something unique to her community. “The vision of the Paseo is that it will be a gathering place for families, creating safe and sacred spaces where people can come together,” said Fraga. But 21-year-old Javier Ruiz, a lifelong resident of Pilsen, has a different view. "It's going to raise the rents, raise property values, and displace a lot of people,” he said at an open discussion called “Development Without Displacement” at La Catrina Cafe, just down the street from the proposed Paseo. The event was organized by Pilsen Alliance, a social justice organization committed to building grassroots leadership and fighting displacement in Pilsen. Ruiz is a member. More than 40 people from the neighborhood attended, including longtime activists and business owners. The Paseo was on the agenda. Ruiz’s family lives on the west side of Pilsen. He never expected property values in the area to go up so significantly, but now his family frequently receives offers from developers to sell their home. Ruiz fears that the Paseo will lead to more restaurants and high-end developers moving into the neighborhood, eventually displacing his family. He worries that the Paseo will impact the housing market in Pilsen much as The Bloomingdale Trail, or 606, affected the majority Latino neighborhoods of Humboldt Park and Logan Square. A 2016 study by the Institute for Housing Studies at DePaul University found that The 606 significantly increased property values within a mile of the trail, particularly in lower-income neighborhoods. On the western side of the trail, which passes through predominantly Latino and low-income neighborhoods, housing prices have increased 48 percent since construction on the trail began in 2013, according to the study. Winifred Curran is an associate professor of geography at DePaul and has been collaborating with Pilsen Alliance since 2004. She says plans for the Paseo are "driven not by community demand, but by what the city and real estate interests think make the city more attractive." "No one is against green space for the sake of being against green space,” she said, “but they recognize that it is going to have negative effects, that is going to displace people. A park doesn’t do you any good if you can’t afford to live near it." Byron Sigcho, the director of Pilsen Alliance, said the city hasn’t properly informed Pilsen residents how the Paseo will impact affordable housing in the neighborhood. “They are talking about allocating public money,” he said. “I’m sure a lot of people will say, ‘Oh, bike path!’ But the devil is in the details.” Sigcho said community members deserve more information so they can make informed decisions. But Fraga said community members have been invited by members of the Pilsen Planning Committee to share input and provide feedback on the Paseo. She says approximately 90 people attended a 2013 public meeting at Dvorak Park organized by the Pilsen Neighbors Community Council, where they discussed green space in the neighborhood, including plans for the Paseo. Many residents were in favor of it, she said, but were concerned about housing costs and gentrification. For 21-year-old Ruiz, who organizes with Pilsen Alliance, the Paseo represents a Pilsen that is slipping away from the grips of many longtime residents, a Pilsen he isn’t willing to give up.